Is it to be consumed with as much moderation when it is applied to the skin, via a cosmetic, as when it is drunk, in the glass or in the bottle? In any case, there are threats to the status of ethanol in cosmetics. 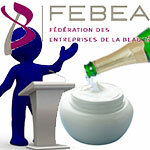 And it is to answer the questions they ask that the FEBEA organizes an information meeting on the subject on 29 June 2015. Why is this ingredient used and does it seem indispensable in cosmetics? What data are available for dermal safety assessment? What changes are envisaged in its denaturing processes and what are the consequences? How to obtain ethanol? And, of course, what action has the European industry taken to defend its use in cosmetics?